U.S. Secretary of State Mike Pompeo, left, waits for the start of the North Atlantic Council at NATO headquarters in Brussels, April 27, 2018. A top U.S. official said Friday that NATO foreign ministers would refuse to "return to business as usual with Russia" until Moscow "withdraws forces and support for proxies in the Donbas, and returns control of Crimea to Ukraine." The unusually pointed demand, tweeted by State Department spokeswoman Heather Nauert, coincided with newly confirmed Secretary of State Mike Pompeo's arrival in Brussels for Friday's ministerial meeting — a powerful message to send to NATO allies for his first day on the job. "I hopped straight on a plane and came straight here," Pompeo told the ministerial. "There's good reason for that. The work that's being done here today is invaluable and our objectives are important and this mission means a lot to the United States of America." Tweeting throughout the initial phase of the Brussels visit, Nauert reiterated those talking points, calling NATO "more relevant than any time since the Cold War," and that today's focus was squarely on "Russia's continued aggression and ability to threaten, coerce, undermine and invade its neighbors." She also tweeted that 22 Ukrainian soldiers had been wounded in last 48 hours in eastern Ukraine, the highest number since July, adding that "Russia-led forces have intensified artillery attacks on Ukrainians defending their country. Russia must end its aggression and fully implement the Minsk agreements." Neal Walker, chief of the U.N. humanitarian mission to Ukraine, told VOA's Ukrainian service that they were recording 40,000 cease-fire violations each month. "As you can imagine, this isn't really a cease-fire," he said. "This is a hot conflict that has a huge impact on people's lives." Analysts say Pompeo has good reason to hit the ground running, with increased tensions between NATO and Russia likely to top the agenda. Pompeo and the other NATO foreign ministers will most likely focus on how to counter Russian cyberattacks and other interference in Western democracies, as well as Moscow's role in protecting President Bashar al-Assad in Syria. During his first year in office, U.S. President Donald Trump criticized alliance allies for not spending enough on defense, calling it unfair to taxpayers in the United States. The president, however, did reaffirm support for NATO while urging allies to pay their fair share. 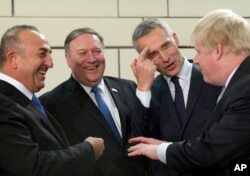 NATO Secretary-General Jens Stoltenberg and other leaders in Brussels said they appreciated Pompeo's quick action to attend Friday's talks. "I feel that that's a great expression of the importance of the alliance and the importance we attach to the alliance, and I very much look forward to talking with you, on the need to adapt NATO to a more demanding security environment," the secretary-general told Pompeo. As of publication time, Russia's Foreign Ministry had not yet responded to Nauert's tweets or Pompeo's visit with NATO ministers. This story originated in VOA's Ukrainian service. VOA's Cindy Saine contributed original reporting.